Taglianetti twins’ bond grows as Penguins’ employees. 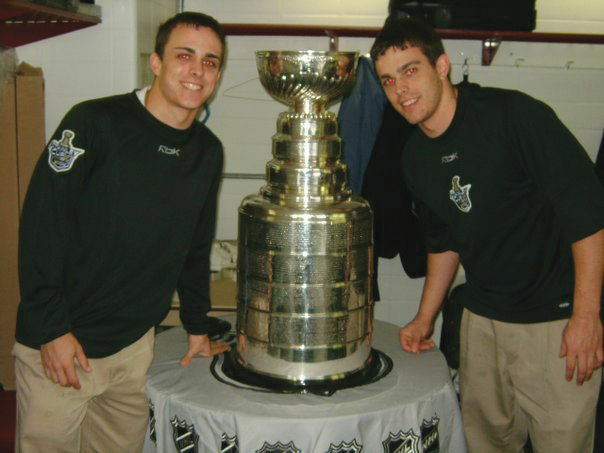 Andrew and Jon Taglianetti got to do the unthinkable after the Detroit Red Wings won the 2008 Stanley Cup over the Pittsburgh Penguins. The 17-year-old fraternal twins drank from the NHL championship’s nearly three-foot-tall, 35-pound trophy. Working the visitor’s locker room at the now-demolished Mellon Arena, home to the Penguins until 2010, as part-time equipment staff during their senior year of high school, their responsibilities included picking up the winners’ gear, which had been thrown on the ice in jubilation, and ferrying it to safety to keep any fans from grabbing a souvenir. When the party made its way back into the bowels of the arena, the delirious players made a point to include the teenagers, who had assisted them for the past two weeks, letting them hold the historic trophy and enjoy some beverage from its 45-year-old silver bowl. “It was surreal,” Andrew said. That Andrew and Jon found themselves there made sense. The two Pitt alumni and their older brother grew up with the Penguins. Peter Taglianetti, their father, had a nine-year NHL career and won two championships in his five seasons with the team in the ’90s before working as a broadcaster from 1997-2002. That sort of upbringing resulted in many notable memories. Andrew recalls stories of he and his siblings sitting in the Stanley Cup in diapers. “Jaromir Jagr used to chase us around,” he said. More important than any hijinks, though, were the impressions Andrew and Jon made. They now work for the team full time, their first jobs out of college, right down the street from the old rink. While all five Taglianetti children (there’s also a younger set of twins) played multiple sports growing up, including hockey, Andrew and Jon decided to focus on football from middle school on. But going into the twins’ sophomore year of high school in 2005, the longtime equipment manager of the team, Steve Latin, needed some help on game days, so he reached out, and the three oldest became “stick boys.” Their first season was also Penguins star Sidney Crosby’s first. Working all 41 home games, they each earned $50 a night to do whatever needed doing: cleaning, filling water bottles, fetching supplies, doing laundry, unloading and reloading bags. Connections made working for the Penguins helped the twins get to where they are now. But before that transition occurred, the twins’ individual roles with the team diverged when they came to attend Pitt in 2008. Both played football for the Panthers. Andrew, a business major, stopped working with the Penguins to focus on football. He played in all games as a freshman, going on to a five-year collegiate career. Jon walked on and redshirted his first year, continuing in his role with the Penguins. He would stop playing football after back surgery in 2009. He was often the only person in the arena at those times. He didn’t mind. “It was something I wanted to do,” he said. Jon became an assistant equipment manager, a full-time position, last August. His superior, head equipment manager Dana Heinze, spent eight and a half years with the Johnstown (Pa.) Chiefs of the East Coast Hockey League, the third tier of pro hockey in the U.S., before getting a long-term NHL gig. From uniform maintenance to cleaning clothes, Jon’s job involves many duties. “I do a lot of sewing,” he said. “Repairing the jerseys and socks we need, the laundry itself, keeping up with the detergent, making sure it’s [maintained]. I do a lot of repair on equipment. If their shoulder pad rips, I fix that. Little things like visors on their helmets, changing that if the guys need it. For Jon, his job gets a little bit tougher when the team prepares to go on the road. “[I’m] constantly on my toes making sure we have everything,” Jon said from New York City last month, with the team on the second stop of a five-game, week-and-a-half-long road trip. Andrew returned to the organization the summer before his senior year when he got an internship with the corporate sales department. The team hired him as a full-time manager of amateur hockey development in May of 2013. Part of a staff of four, in his role, Andrew functions as the middleman between the Penguins’ amateur programs and his three co-workers, as he manages business and administrative details. The contrast between how the twins work in the same building isn’t lost on Peter. Both brothers appreciate that Peter’s career opened doors for them. “I don’t know if I’d be in this situation, or Andrew would be, if it wasn’t for what he did, all his hard work,” Jon said.